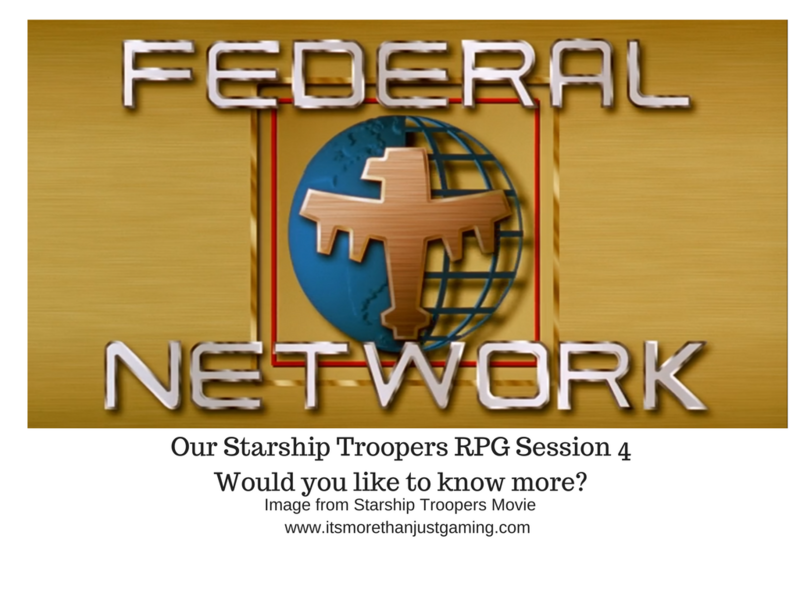 Our Starship Troopers RPG Session 4 – Would you like to know more? February 23, 2018 January 25, 2018 JohnGames / GamingNo Comment on Our Starship Troopers RPG Session 4 – Would you like to know more? Shrieking came from down the tunnel system, and we realised we may have awakened a swarm. Unfortunately our mission required us to be absolutely sure of any new species of Bug’s destruction, and to be absolutely sure that nothing survived. So, we ran towards the swarm. Naturally, being in the walking Tank I was on point followed by McDwarf’s robot and then the squad. We found an open cavern with a large bug that looked like a warrior with an antennae (and one missing. You may remember we were able to grab an antennae way back in session one). We rolled initiative. The new bug got 20 and we got low scores. It charged into Melee with me. It hit me, but Marauders have a lot of hitpoints. Fighty’s robot, Chaz charged past and began pounding its piledrivers into the side of the new bug. A line of workers and warriors were already approaching. Fighty himself, Rope Boy, Coward and Dead Shot opened fire on the line doing significant damage. Unfortunately, Echo was less successful in her accuracy and missed every shot. Even worse, a bug warrior closed with Coward and penetrated his power armour with claws doing enough damage to put him into critical/verge of death list. Coward was out of the fight. The line of bugs closed with us. Rope Boy did a good job of weakening with a couple of good grenade throws, whilst Dead Shot thinned the herd. Echo, wisely tried to make a precision shot on the Alpha Bug, to remove the remaining antennae. Sadly this is a difficult shot, and as noted, Echo was not going to win any marksman medals this night. Fighty hurried over the gurgling form of Coward, and stabilised his bleeding ruined form. Not sure how. Possibly welding his guts shut or something like that. Either way, Coward was still out of the fight but no longer in imminent danger of death. Chaz accompanied Fighty to provide cover, mashing the Bug Warrior that had previously decided to decorate the cavern with Coward. Some more fire from Deadshot and Rope Boy continued to thin the Bug ranks, though that still left the alpha to me. In my defence my line of vision was impaired by a murderous bug immediately in front of me. Disaster struck as one of my guns jammed and this allowed the Alpha another shot at me, which removed the offending arm in its entirety. All the while, Fighty was feverishly working on stabilising my legs. Chas and the squad had all but annihilated the first wave, but a second was forming behind the tanker ready to charge. Risking exposing myself to a counterthrust I moved my marauder back out of Melee range, which caused the alpha to tear into my chassis and cockpit. The chassis had about 130 more hitpoints. The cockpit had 1. I didn’t care. As soon as i got to range I opened fire with remaining weapons at the alpha, my Morita, a Cannon and two grenade launchers. The pounding I inflicted on the Alpha opened up more than a few cracks in its armour much to my satisfaction, which allowed Dead Shot to take a precise shot into its head, felling the bug. Chas was a little scorched by the grenades. Fighty had the presence of mind to cling onto my legs as I backed up. The Bugs stopped. The Tanker had not yet fired, slow as it was and out of position. And now it simply stood there. And so did the swarm behind it. It was more than a little spooky. Not wishing to look a gift bug in the mouth, the squad opened fire as one on the Tanker. Well, the squad except me. “Got something better!” I yelled back, and then informed the GM I was opening fire with my Grenades, my Cannon and my Two rocket launchers. I had not used the rocket launchers as it was imprudent in close quarters but now was my time to unleash everything. The Rocket Salvo and grenade explosions consumed the entire swarm behind the Tanker, wounding it sufficiently so that when the canon shells hit its hind quarters disintegrated; all that was left was a goopy mess of internal fluids and chitinous ruin. The Tanker was crippled. “One doorway coming up,” I said. I was asked by the GM how many rockets I was firing. I thought for a second and said One. One explosion and partial cave in later, we were scrambling up the rubble into the facility. I had evacuated my Marauder as it was too big and was more than a little dinged up. We found ourselves in a chemical storage room. McDwarf rigged a primitive charge in the room to aid with future demolition. We then proceeded to systematically search the facility. It was almost as spooky as the cavern when the bugs stopped. The place was deserted. We found a ready room with entertainment vids and screens that had accumulated a couple weeks worth of dust. We found a mess hall with meals half eaten and starting to grow mold. And, we found a room where there were still people alive, but they were almost zombified. They were emaciated, showing signs of starvation and simply staring at a device that we couldn’t identify. A check of them indicated they were facility security and scientists. We tried waking them up with no success, nor could we find evidence of spores. We continued on our search and found an office. As soon as we entered we were hit by an oppressive feeling that we later discovered was a psychic wave. Standing in the office behind a desk was a man wearing the same uniform as our major. That was the last I knew before I passed out. When I woke up the man in the Military Intelligence Uniform was dead, single gunshot wound to the head. Dead Shot apparently is more resistant to Psychic waves than I and put a bullet in him. We searched the office and found some journals and a switch, which we clicked. This revealed a secret door where we found what appeared to be a malformed Brain Bug, and I took a nap again due to its psychic powers. Fortunately Rope Boy did not and rolled some grenades in. I woke up to the sound of explosions and the dying shrieks of the Brain. We then examined the journals. The officer we had just killed was only identified as major. The entire facility was set up to create a new type of bug, a bug that could be controlled by the federation. And then these bugs were to be inserted into the regular bug population to create a bug civil war. The journals became more erratic as we progressed. The Major referred to the project and realised he had been infected by it. We found a small spore on him which probably accounted for the zombified humans in the facility. Further searching revealed some humans who had died, blood spilling from ears, nose and mouth. This was psychic death. Echo recorded all of the data, and after completing a sweep of the facility and finding no others alive, we placed our last charges and evacuated. I left through the entry tunnel to collect my marauder and Coward, whilst the rest of the squad ascended a flight of stairs in the Brain Bug room which they rightly concluded led to a concealed landing pad. We called for pickup and were returned to the Marty Robbins.